Turns out, what’s caused this problem is that the server was configured to use WSUS instead of Microsoft Windows Update server. Because Windows needs to download the 3.5 installation files from Windows Update service, it couldn’t if it’s configured to use WSUS. The fix is also pretty straightforward, just one Group Policy setting that needs to be changed. And you can do so through Local Group Policy so it doesn’t affect the Group Policies you have in place on a domain level. 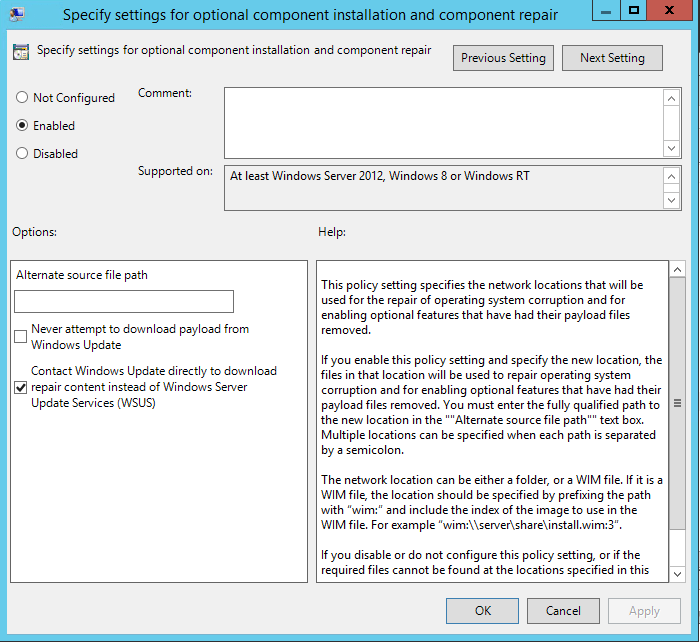 Open “Specify settings for optional component installation and component repair” setting, select Enable and choose the “Contact Windows update directly to download repair content instead of Windows Server Update Service (WSUS)” checkbox. .Net 3.5 feature got installed successfully after I tried again.